Shannon Ivey on the mic at Story Slam 2017. Alternate ROOTS is pleased to announce the recipients of the 2018 round of Artistic Assistance Professional Development. Grants were awarded to eleven individual artists and cultural workers in the South to enhance their skills, create unique projects, and build community, for a total of $21,000 in support. These recipients were selected in July 2018. Congratulations to this fantastic array of artists and cultural workers, who are helping to create a better South, and a better world! Esmeralda Baltazar, San Antonio, TX: to purchase graphic arts software and a MacBook Pro. Ching-in Chen, Houston, TX: to attend a convening for transgender and gender nonconforming Asian Pacific Islanders at the National Queer Asian Pacific Islander Alliance (NQAPIA) Conference, which will help develop the artist’s current project, Formerly FloodLand. Jessica Clark, Fairmont, NC: to attend a four-week residency at the Vermont Studio Center in Johnson, Vermont. Sage Crump, New Orleans, LA: for computer recovery and repair. Shannon Ivey, Columbia, SC: to engage two Alternate ROOTS members as mentors, take online classes, and purchase equipment including a used MacBook in support of the #whatshesaid storytelling project. 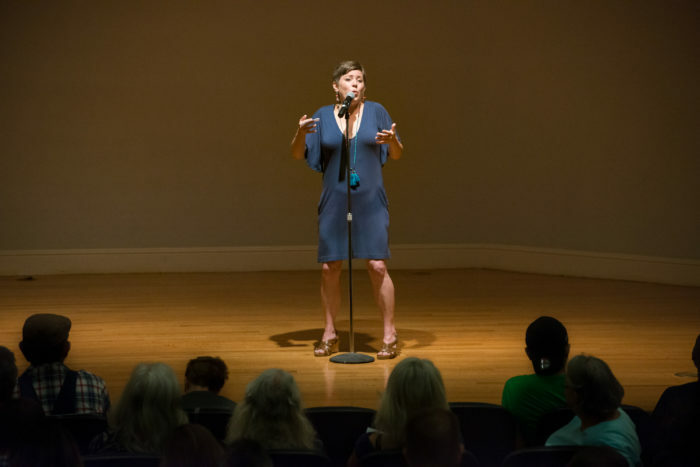 Ashley Minner, Baltimore, MD: to support participation in the exhibition, WE NEVER LEFT: Artists of Southeastern Indian Tribes, at the Museum of Arts and Sciences in Daytona Beach, Florida. Yudith Nieto, Houston, TX: to purchase a laptop, digital illustration software. Rhonda Oliver, New Orleans, LA: to work with a consultant on website development and purchase computer equipment to work with formerly incarcerated women. Taria Person, Nashville, TN: to do a workshop production for their play, Hangers – a theatrical work advocating for self-acceptance and liberation. Thandiwe Shiphrah, Nashville, TN: to purchase a digital cinema camera. Shantell Turner, New Orleans, LA: to purchase a sewing machine and develop a youth-focused sewing training program. Jessica Valoris, Washington DC: to purchase equipment needed to create a mobile media lab.